May’s Colour of the Month challenge is Effetre 212 Lime Green, and the theme challenge is Spring. 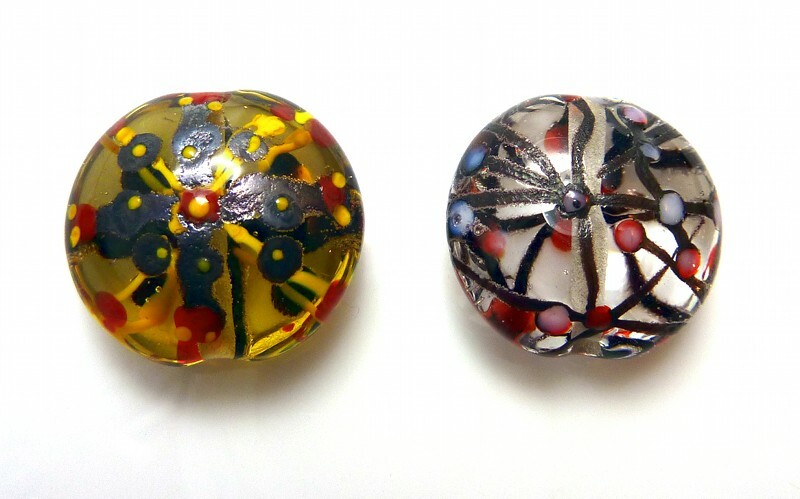 I made beads for both. I started by trying some ringed spacers. NTS: dark yellow doesn’t actually show up that much on lime green… It’s also a tad trickier than it looks to keep the rings even. I tried again with orange fine stringer instead. 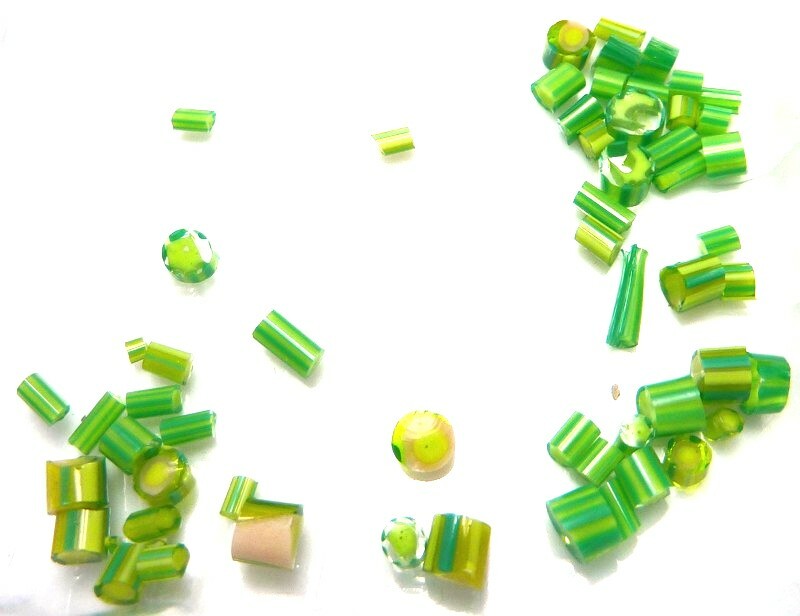 Lentil sets: clear with lime green dots of various sizes, topped with white dots, repeat until you can’t make them any smaller. With matching pair of spacers. 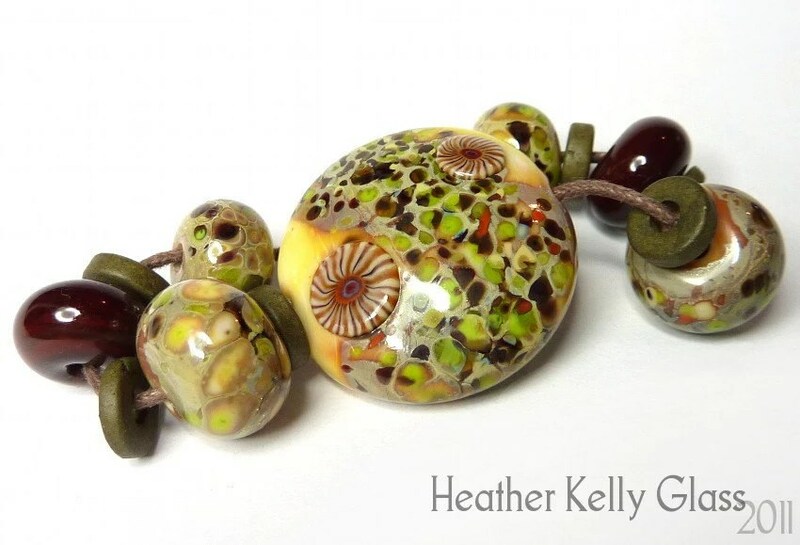 Then I did the same with CiM olive and lime green. 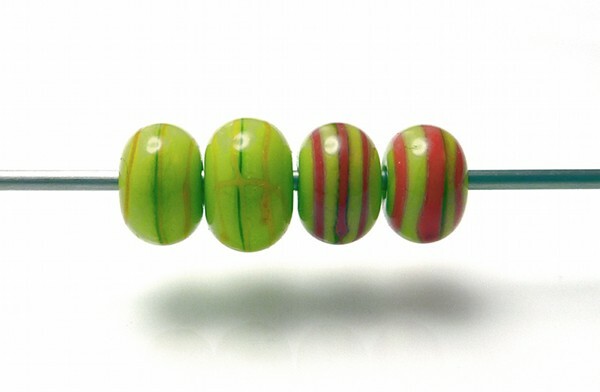 Big stripy lentil: transparent sage green base, with stripes of opaque sage, lime green and red brown stringer. 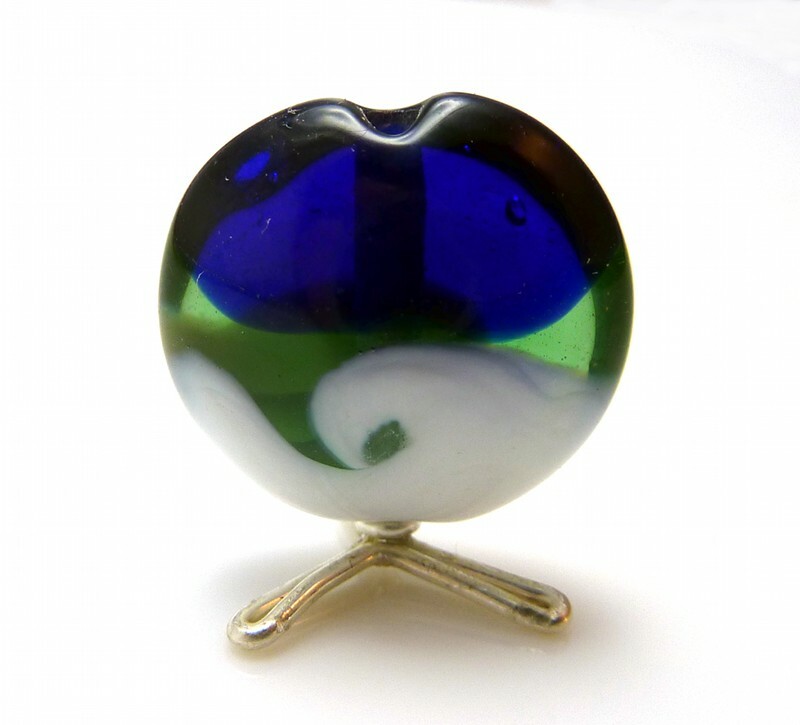 Faux boro using pale green apple and iris gold frit, encased in clear. None of the cola colour I was getting with my straw yellow. A faux boro lentil: didn’t photograph incredibly well – the light shining through it makes it more amber than it looks normally. Plus another couple of rounds, with different stages of adding more frit. Red roof tile trio: lentil plus spacers with SIS round the centre. 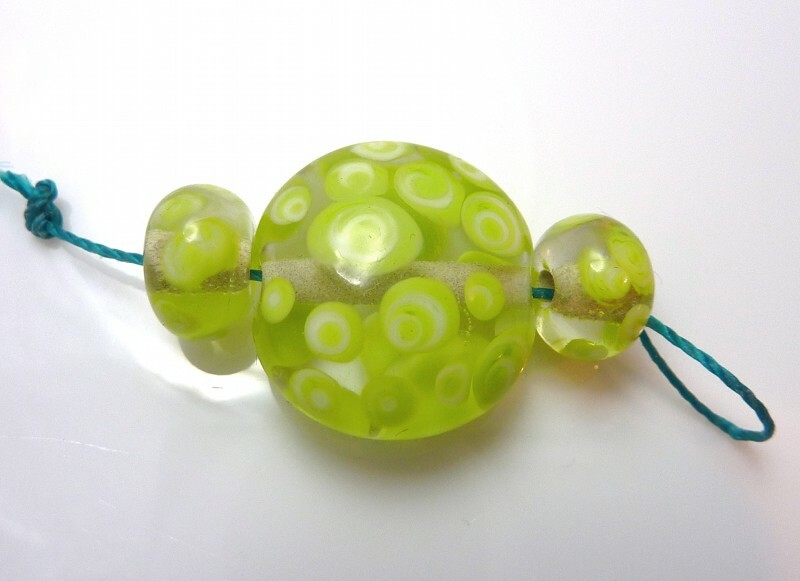 Set with lime green base and petrol green raked dots. 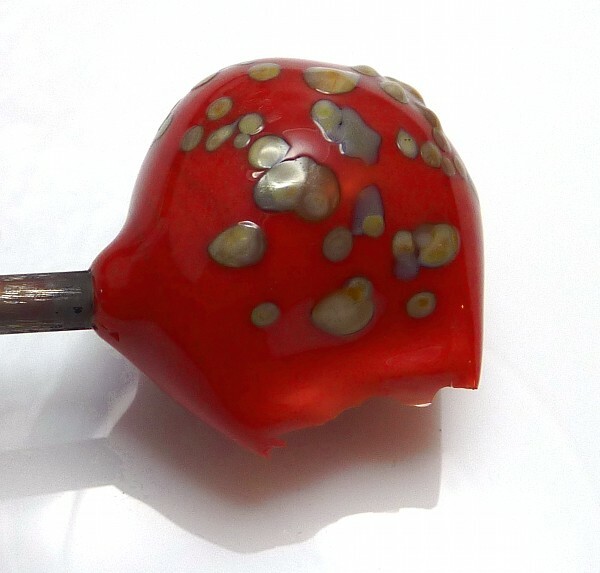 Garden bead with red roof tile for the ground and dark blue transparent sky. 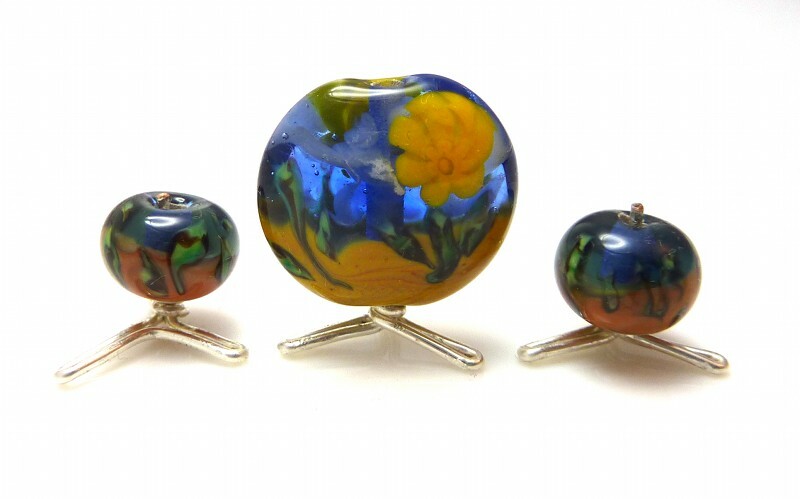 Anise white clouds, vine cane and yellow commercial millefiori, with a pair of matching spacers. 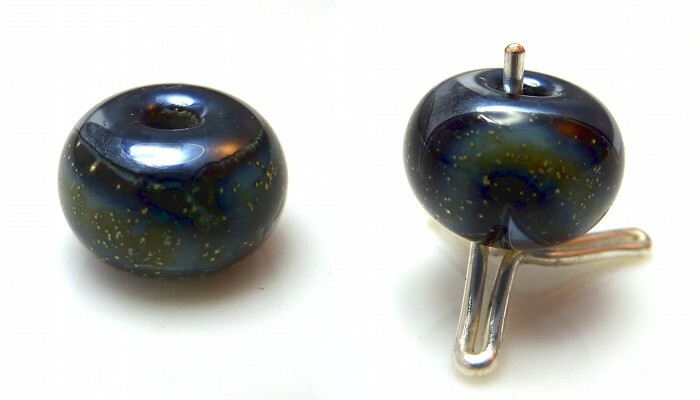 Pale green apple hollow rolled in iris gold frit. Hmm, too much frit and iris gold is better if you do more with it. Then I tried making murrini, partly so I would have some bullseye style ones to practice using so I wouldn’t waste the ones I bought from Kaz. My first try wasn’t hugely successful – I pulled most of it way too thin. So I tried again, with more colours this time, and found out that you really do need to use very contrasting colours. Lime green and CiM butter pecan might look different enough, but they really don’t show up against one another once you’ve pulled them down and tried to use them in the centre of a murrini (which is the part that gets smallest when you actually use it – the edge spreads out a lot, making the stripes on it bigger). I tried making shards again with a blue frit mix on Effetre rose quartz. But the part that actually blew up thinly didn’t have any frit on it… and I got cellophane thin very pale transparent shards. Not so useful! This is a rose quartz lentil with the thicker pieces that did have frit on them. 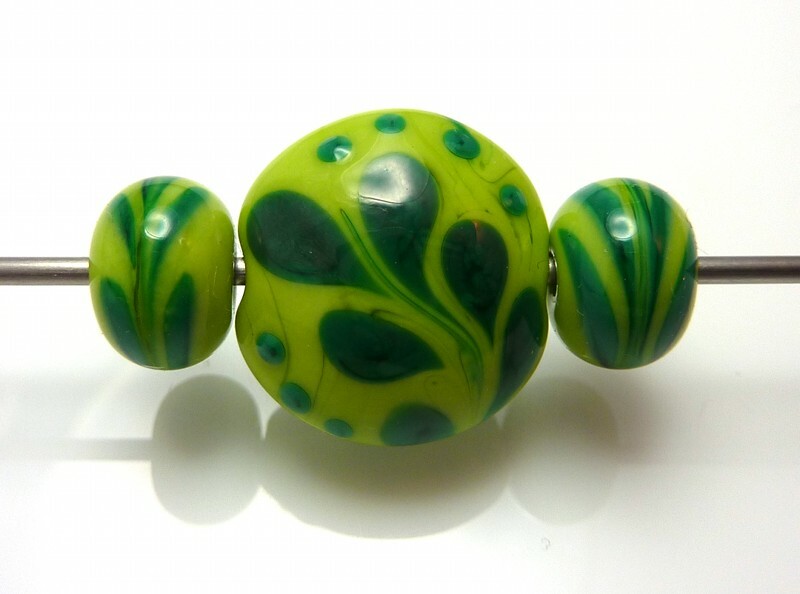 Another garden bead, this time with lime green between the ground and the sky. I used a pink commercial millefiori, didn’t cap it with clear and it devitrified. Another one for the etch pile, I think, as otherwise the bead’s quite nice. Then I started practicing using twisties, because I won the silent auction for Jolene’s Huge Jar o’Twisties, so I thought I’d better work out how to use them! Here we have a pea green lentil with opaque blue twistie. I added eyes and turned it into a sort of snail. Then we have a dark amber lentil with a twistie that Mizgeorge gave me, and a light ivory lentil with swirled SIS and red and clear twistie from Mizgeorge over the top. I made some black and white simple murrini (Effetre black, so it’s purplish). Some twistie rounds. The red and blue ones are encased to spread them out, the purple ones spread out enough on their own so I didn’t encase them. I think they look like sweeties. And also a clear lentil with subtle semi-transparent blue twistie in it. You can see it better in person – it has misty lines. Pictures of the murrini in use coming up. My wheeled glass nippers arrived halfway through the next week, so I could cut them up and use them then. 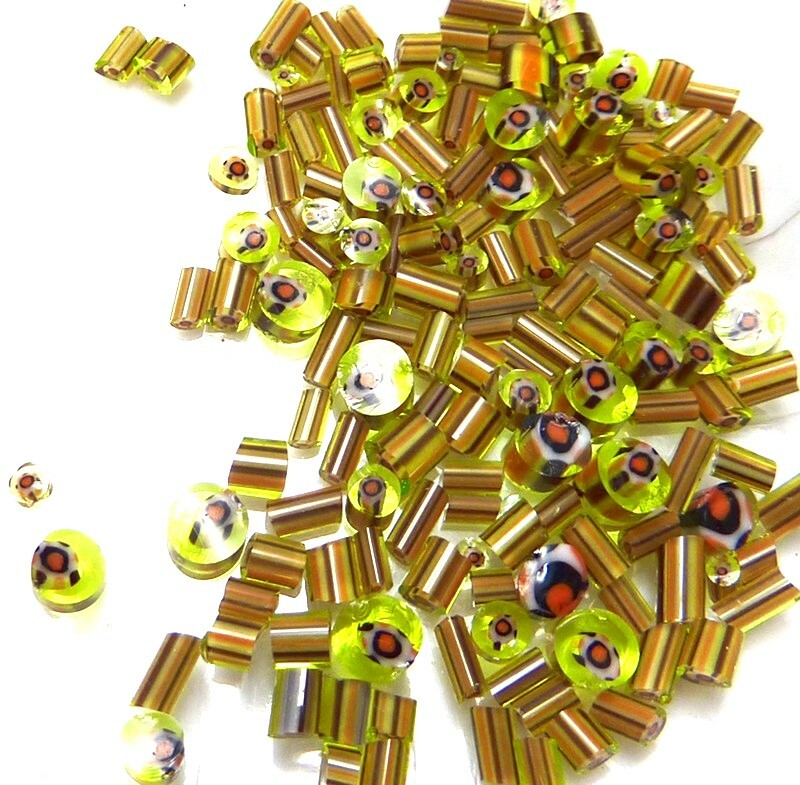 (I got Leponitt ones from mosaictraderuk.com, and I do love them). At the Flame Off I got some Plowden & Thompson 100 CoE glass so that’s what I had a go with next. 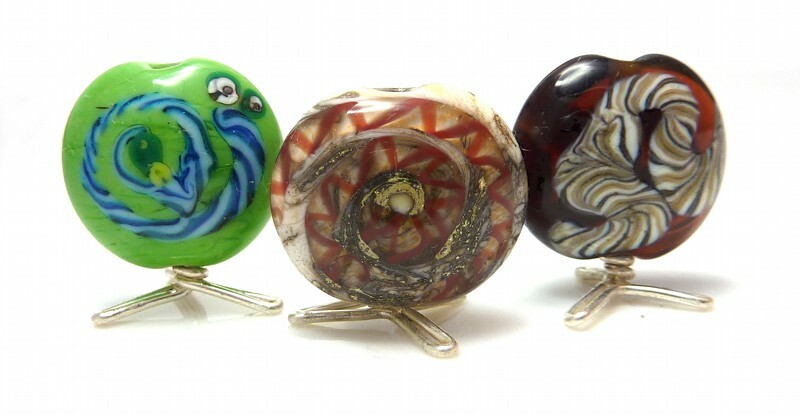 (Plowden & Thompson are a British glass manufacturer that make 100 and 93 CoE glass). I made a Plowden & Thompson Show and Tell thread on Frit-Happens! and I’m replicating my posts here. Other people have posted in it, and if anyone reading has anything to add, do go over there! 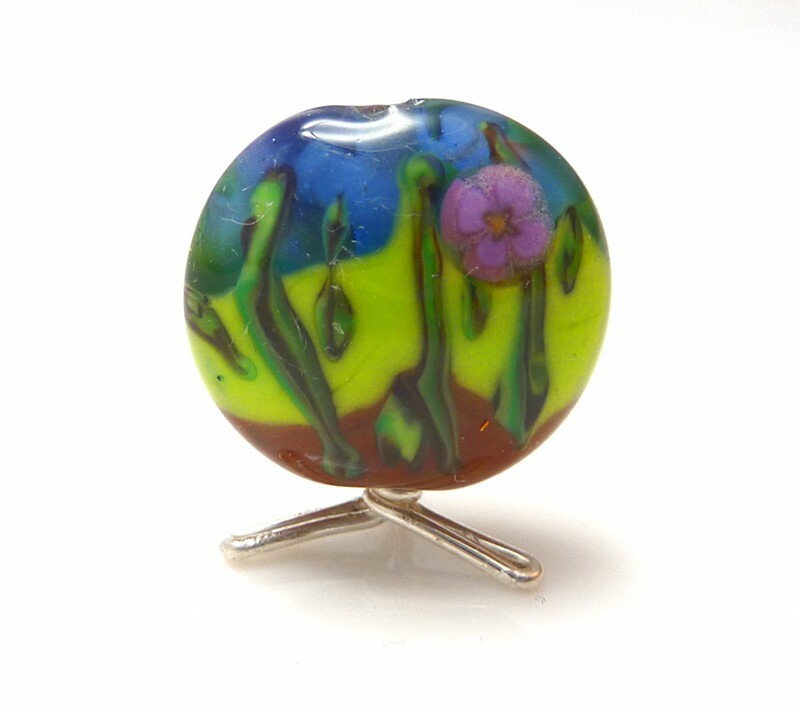 There’s very little information on what their colours actually look like (their website is somewhat notorious for not having any pictures, which is one reason why they aren’t used more by UK lampworkers) so I took pictures of EVERYTHING. You can see it tends a lot to the reds and yellows! I would have liked to try pinks and purples and some opaque blue, and I am definitely missing having white! My first impression: some of these rods are a lot thicker than I’m used to using! I think when you’re ordering from them you can specify what thickness you want, and the really thick ones weren’t too much of a problem. I was just very cautious with them! I started with the Electric Blue (the cracked lentil below) and was immediately wondering what I’d let myself in for! It was a normal thickness rod, probably the thinnest in the pack, and I found it extremely stiff and also prone to boiling. A lot. So I was in the situation where the surface was boiling before the centre was molten enough to move, and I was trying to work as far out as I could. It was my first go with my lentil trio from Maria Louisa and I got a decent shape, but I mustn’t have heated it back up all the way through before putting it away. Probably because I was trying to stop it boiling! The colour is very similar to CiM Pulsar, but it boils more and is much stiffer. I quite liked pulsar, so will be keeping it over this. Then I tried the Mint Green. Pretty colour, not too stiff. 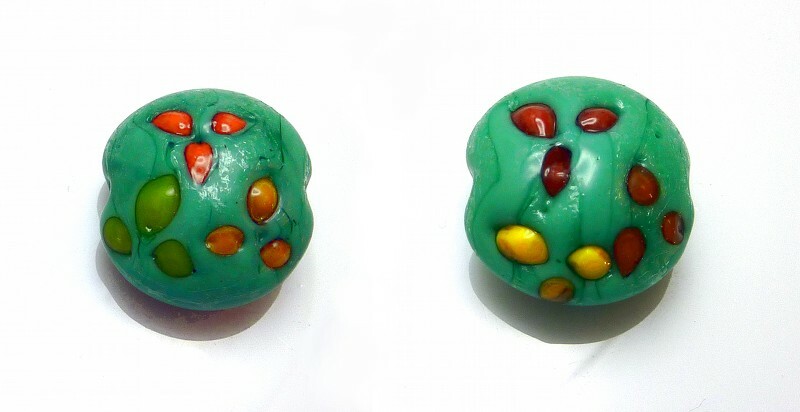 It seemed to start boiling just as I was finishing the shaping, but it’s not very visible on the cooled bead. Dark Post Office Red: very thick rod, heated it carefully and tried to stay higher up after my problems with the first two. Didn’t get any boiling and it is indeed a dark red. Golden Yellow lentil: nice ambery colour. My lentil didn’t break! Water Green: what it says, really! Nice colour, though I have a pile of Effetre trans greens that I haven’t tried out yet. Might be similar to a pale emerald? Vanilla: OMG I love this colour! It is beautifully soft and is what I think dark ivory *should* look like. It’s slightly darker in shade than my simple spacer of CiM Ginger (though I think you can get that to look pinker with more heating?) and is yellowy cream not pinkish. I will be ordering more of this. I’m already worried about using up my only rod of it! Post Office Orange: a reddy orange. Not bad. Some swirling round the ends, so I think a lentil of this would have some streaks. My notes don’t say anything else, so I assume not much else happened! It didn’t boil, and was a big thick rod so took a little while to heat up, but not frustratingly so. 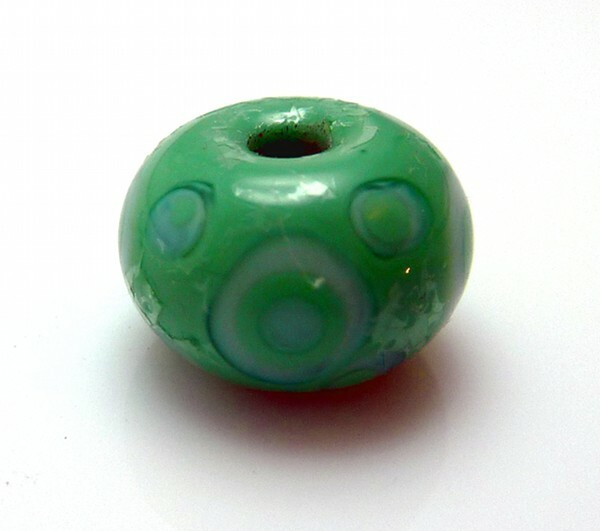 Then I got tired of making plain spacers that day so did a Daylight Blue base with Antique Green dots, melted in and then small raised daylight blue dots between. The blue was boily after a short while – there was one place with a lot of large bubbles coming up. At this point I switched to trying my 2mm mandrels for the rounds, rather than 1.6mm. I’d used 2.4mm at the Flame Off because that’s what was available, and they took a little getting used to! I do prefer 2mm stringing material though, so I thought I’d start practising with more sizes. Next day I tried Daylight Blue again on its own – it was still rather boily though not quite as bad as before. 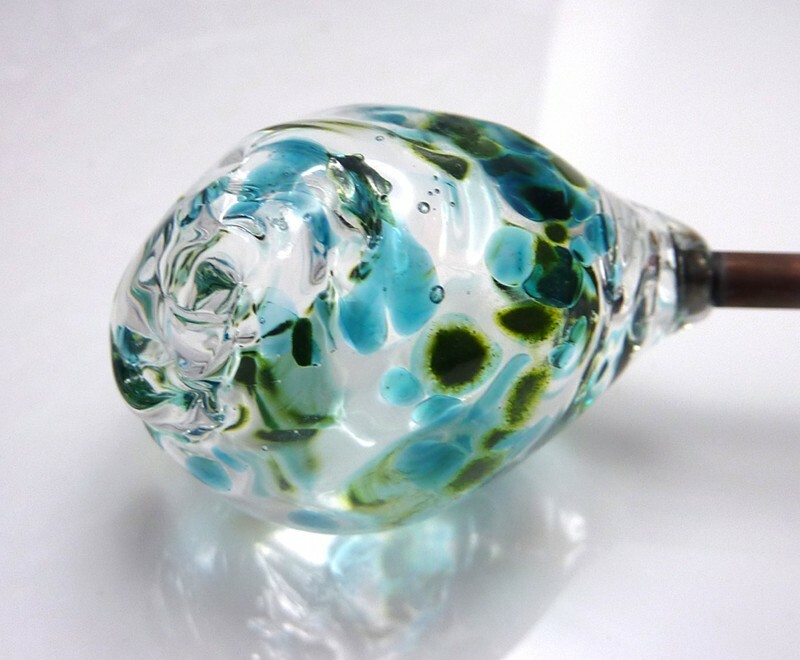 Very similar colour to Effetre transparent turquoise. Antique Green: very dark as a spacer. I had to be a bit careful not to boil it, but it wasn’t as bad as the blues. Misty Orange: I liked it. Not boily at all and the first colour in a while I could get hot without worrying about it. 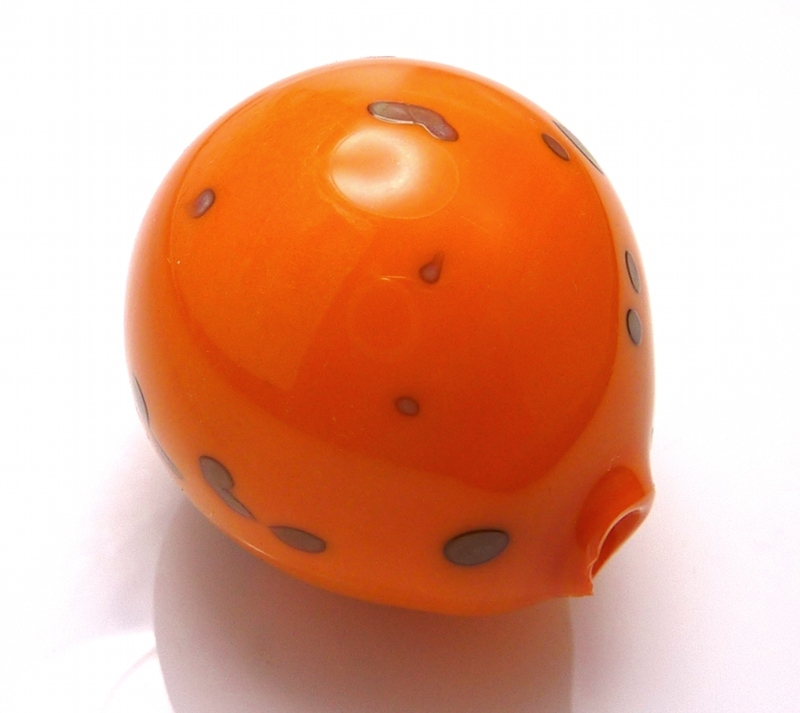 With the spacer it is translucent with striations round the holes, though mostly opaque round the centre. With a flatter shape you’d get lots of variation, and probably the hotter you get it the more opaque it goes. Bright Orange lentil: I found this nice to melt, softer, and I thought it wasn’t boiling… but when I took it out after cooling I could see little brown burnt dots, mostly near the edges. The notes in P&T’s catalogue say that it’s a ‘difficult’ colour and is prone to pitting. Aww, it seemed easier until I got the bead out! I really couldn’t see the bubbles forming while it was hot. 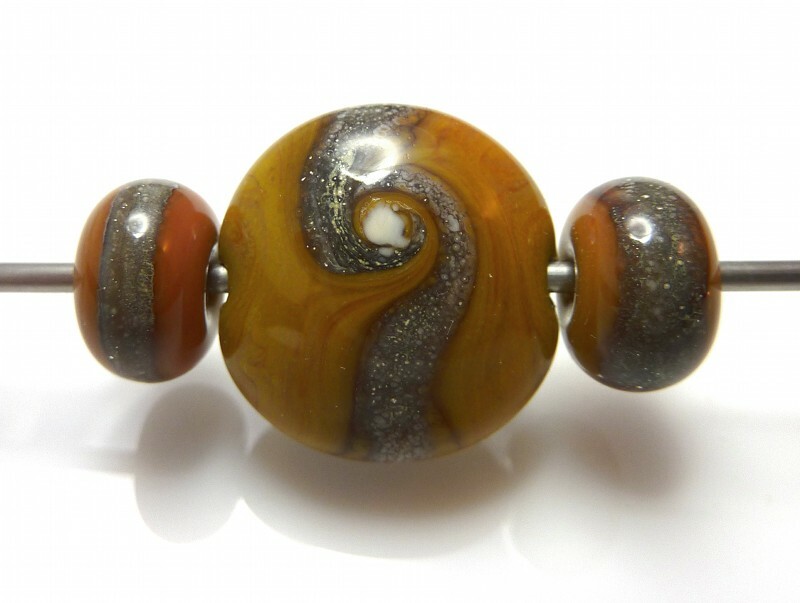 It has a dark amber wiggle and dots for decoration, then small black dots with raised orange on top. Dark Amber: not too stiff, not boily. Very dark as a spacer. Canary Yellow: quite an acid yellow, and it seems to stay semi-opaque. You can see little variation rings all round it and more pronounced at the holes. I am intrigued. Burnt Orange: it’s a tangerine orange. Ditto with the variation round the ends, though it’s opaque round the middle. Bright Orange lentil mk 2: trying again. I added black stringer squiggles over both sides, and was delighted when they came out a silvery pewter! The end of my black rod had gone silvery after applying the dots last time, so I had a vague suspicion that they might do this. Love this black! I seem to have half a kilo of it, so it’s just as well! (It was the pack size they had available at the time). I checked the catalogue notes afterwards, and indeed it says this this goes silver, though it says to work in a cool oxidising flame to do so. Apparently a normal hothead flame also works. Unfortunately I again ended up with some small brown bubbles on my lentil, though less than the first time. Emerald Green lentil: this came out ugly. Oh well. It was stiff but not too boily, and a very thick rod – I was worried it might shock, but it was ok. I used a black, bright orange and dark amber twistie on it, which was probably a bad idea. The twistie looks pretty in itself, but I was really wanting some white to try it on. Not a good lentil shape, though I did accidentally start it on a 2mm mandrel rather than a thin one! Pressed ok, I think I just lost patience with melting the surface down enough. Light Amber Eyeshell: it’s light amber. Not sure where the eyeshell comes in! Royal Blue: another huge rod. Not bad once I’d heated it up enough! In a spacer it looks like Effetre cobalt blue – I’d have to test them over white to see if there was any difference in colour. 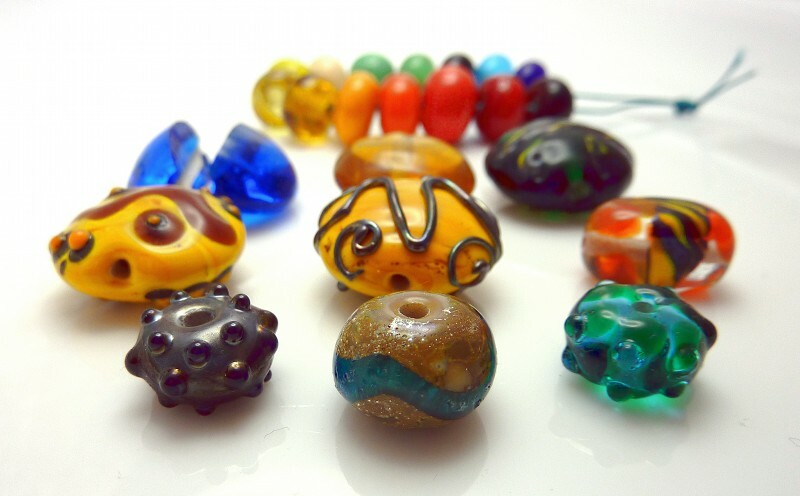 Clockwise from top left: dark amber, dark post office red, post office orange, misty orange, burnt orange, light amber eyeshell, cider, canary yellow, vanilla, mint, water green, antique green, daylight blue, royal blue. Then I did some additional tests of the vanilla and black. I made a vanilla round and rolled it in silver leaf, melted that in and put a wavy line of electric blue round the centre. This was to test if the vanilla does in fact react like ivory. Short answer: yes! Love the reaction, and I want to do one where there’s less silver on the base so I can see what it does round the edges. Anyway, I’m going to experiment a lot more with this one! 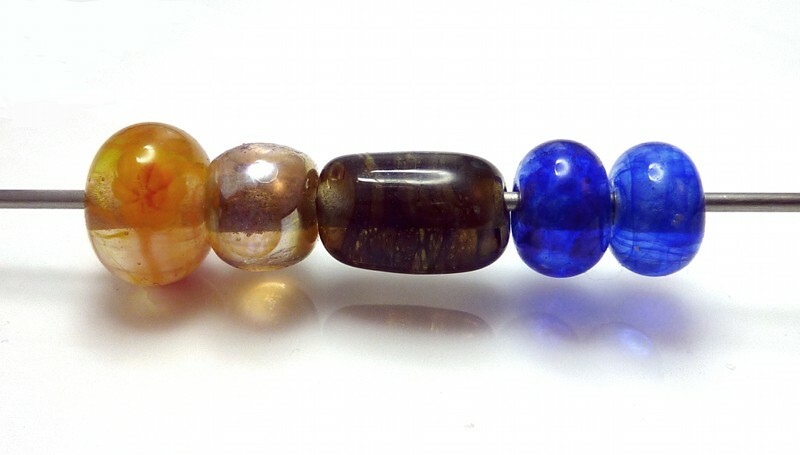 Lentils: electric blue, golden yellow, emerald green with twistie, bright orange with dark amber and black, bright orange with black (silvery). The oblong one started out intended to be a lentil, but the bead release broke at either end so it could rotate. I had a skinny oval of clear and added a wrap of twistie round the centre and some misty orange dots, then squished it into a cuboid so the ends weren’t all pointy. Front: black, made silvery with raised dots; vanilla with silver leaf and wavy line of electric blue, daylight blue with antique green dots and raised self-colour dots. In conclusion: vanilla and black are a hit. I don’t think I’d get any of the transparent blues or greens – I have plenty of Effetre ones and I found them much easier to work. Mint green is pretty, not sure if I need it. Have to see how the colour compares to Effetre grasshopper. And I think I’ll want to keep some of at least one of the oranges around, after further testing of how stripey they stay. I think it’s going to be interesting to keep working with the colours I have here for a bit, because while I quite like orangey yellows in small amounts, I don’t usually use anywhere near as many as this! The only non-red opaques are vanilla and mint. I do want some of their diopal white. I’m thinking I might try them over Effetre white – I asked if there were likely to be problems with that, and was advised to treat it like frit. Don’t mix too much of the different CoE glasses together. 1. Wound on, shaped quickly, didn’t leave the flame until it was done. Stayed black. 2. Took it out at the end, let cool so still glowing but not molten, flashed in the top of the flame. Silver! 3. I repeatedly heated and cooled this one. If you put it back in the flame after you get a silvery surface, you can see haze over the surface before it heats back to bright orange. I took it out while it was still hazy: it’s silver but slightly more matte. 4. Here I made the base, then added a stringer line and dots to the surface and melted them in. I was trying to get it to boil – it looked like it was a tiny bit, with white spots in areas, but that isn’t actually visible. I took it out and it looked black, so I heated it up a little again. It’s very slightly bronze-black rather than silver. 5. Black with silvered vanilla stringer. It went blue! It makes me think of galaxies. I’m going to get a better photo of this one on its own, as it’s rather pretty and totally not what I was expecting. 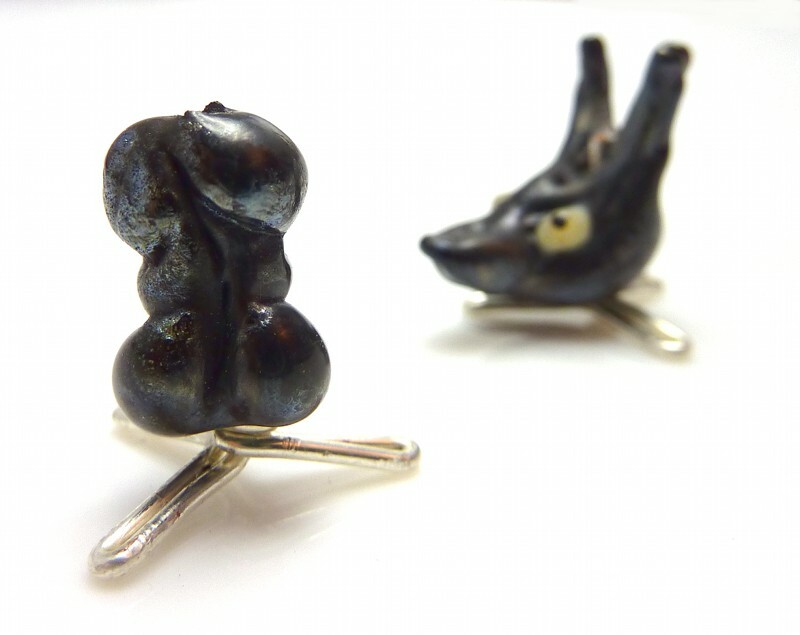 Even the ends of the bead look pewter blue rather than pewter grey. 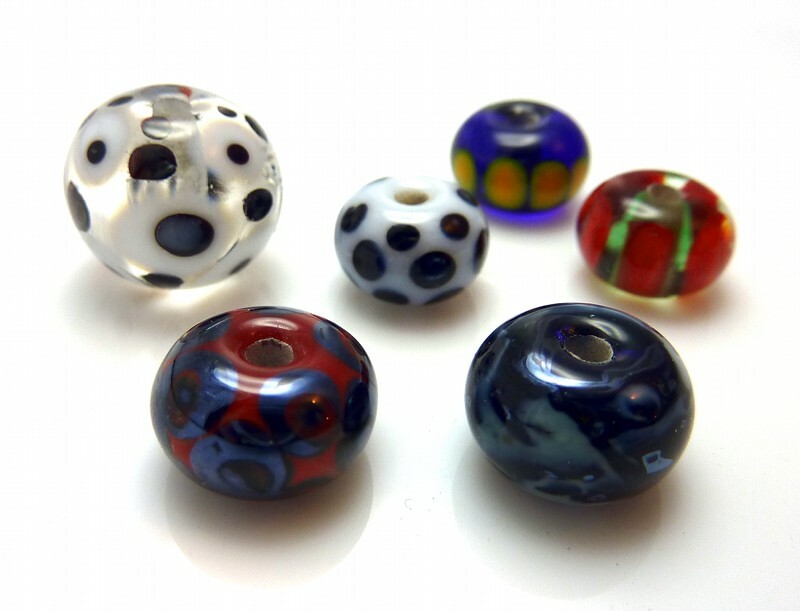 The black is mostly well-behaved, but a couple of times I got that dreaded glass-cracking ‘tink’ and the rod would shock straight across and a large piece would come off. 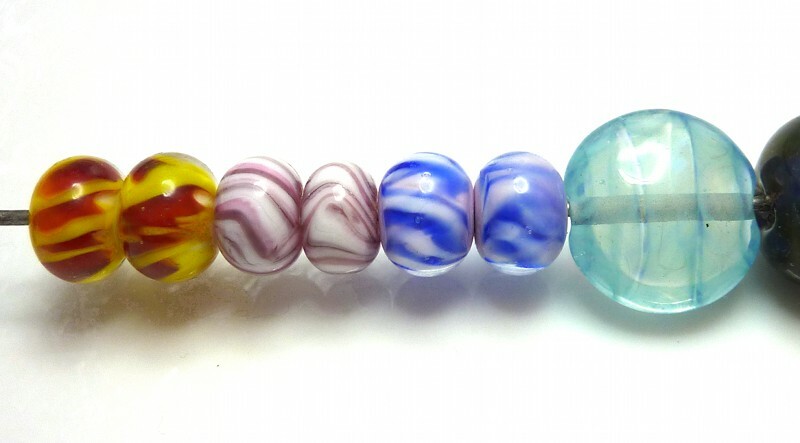 This happened with bead 5 while I was winding on – luckily after the glass was attached enough to the mandrel to just wind the rest of it on. You can’t easily see *where* it’s shocked, either, which makes things interesting. Next I checked the stripiness of the oranges. Here we have misty orange on its own, and burnt orange with mint florals, daylight blue on top of the larger ones, and canary yellow centres. The daylight blue didn’t really show up as anything other than ‘something transparent’. There’s a reaction line between the orange and mint, and also with the canary yellow. 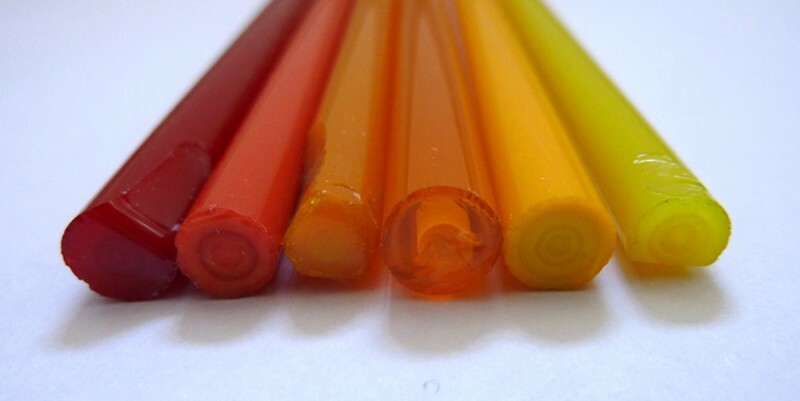 The yellow is very interesting as it’s definitely semi-transparent. Right, here’s a closeup of the black with SVS. It gets a line of actual black around the edge of the vanilla. Next vanilla with SVS. Mmm, humbug. So the vanilla itself isn’t very reactive (also there’s a bit more surface variation in the photo than there is in person, because of reflections – it’s a very smooth uniform colour between the lines). This was done over a core of clear. I haven’t mentioned the clear yet – it’s nice, fairly soft, and I’ve had it shock straight across like the black only once. 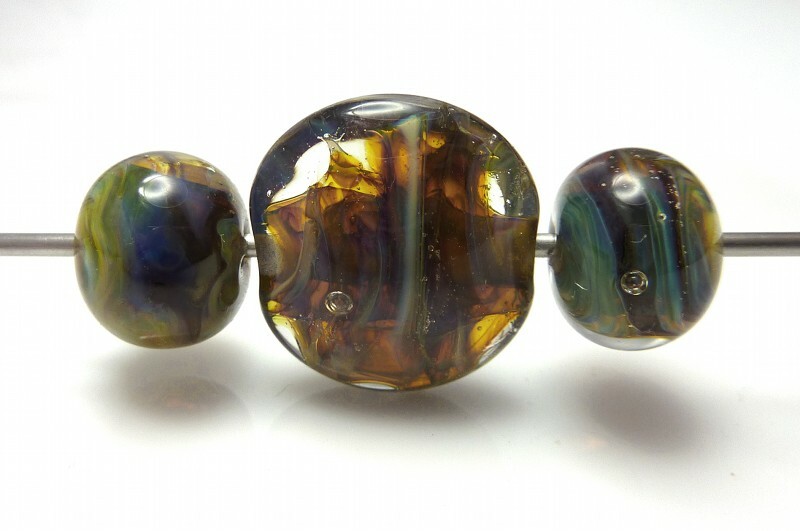 This one was interesting while I was making it, because the vanilla goes clear when it’s hot, so I was rounding off a bead that I could see all the way through, apart from the lines round it! 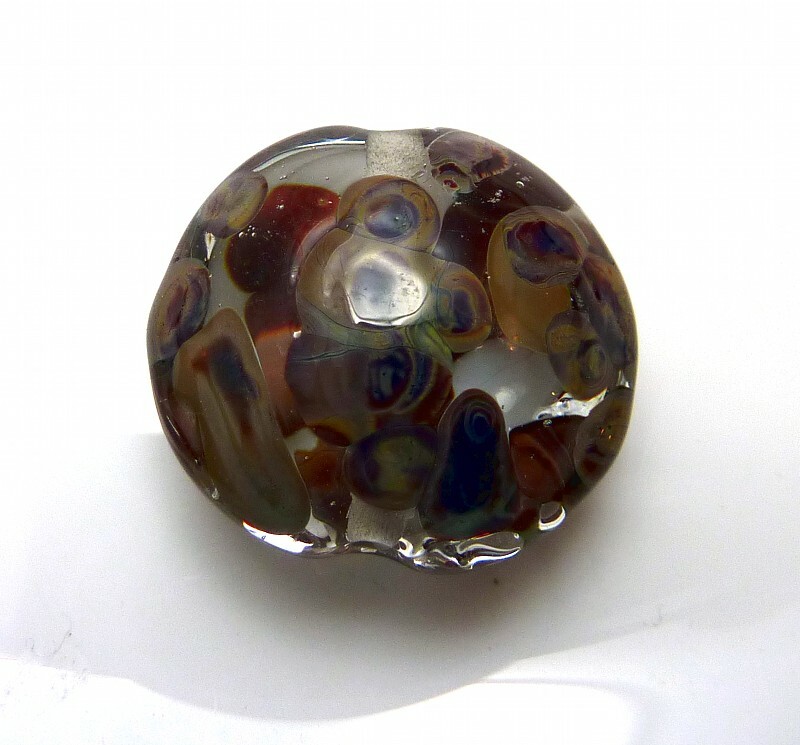 NTS: make a clear bead with SVS. Purty. I was hoping for a bit more of a reaction, but it’s very well-behaved. And lastly, I decided to test all the mostly-opaque reds, oranges and yellows on top of mint green. Lines for all! The yellow is very definitely semi-transparent. The mint had lots of teeny bubbles coming to the surface after not very much heating, and just got more as I progressed. As a result its surface came out a bit strange – it looks like it has cling film on it in places. Am wondering what would happen if I selectively etched it. Side 1 has post office orange, canary yellow (semi-trans, looks green) and burnt orange. Side 2 has dark post office red, bright orange and misty orange. Black with vanilla wavy stringer. Still get the interesting effects! Again there’s a line of non-mirrored black around the edge of the vanilla. Black with clear dots. Bit tricky to see here, the reflections are hiding them – the clear dots mean there are normal black dots on the shiny surface. It’s quite nice, if rather subtle. Then there are three over Effetre white: royal blue, antique green, and emerald green. 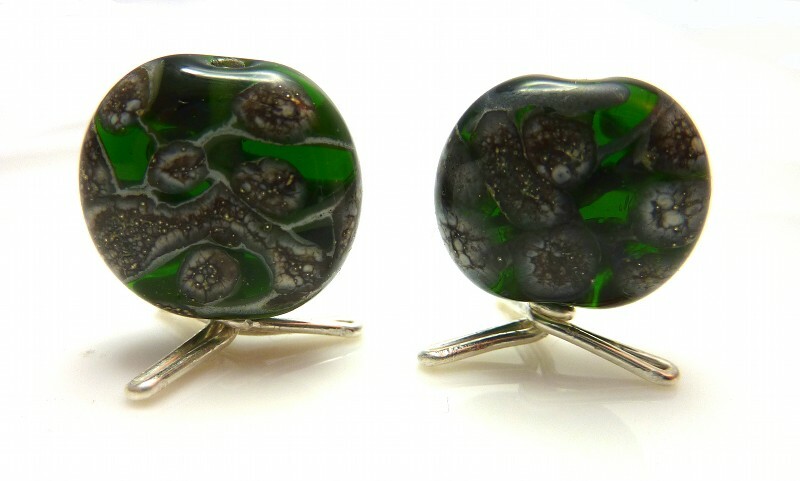 With the emerald green you can see slight separation lines in the white around the dots, like you get with frit. 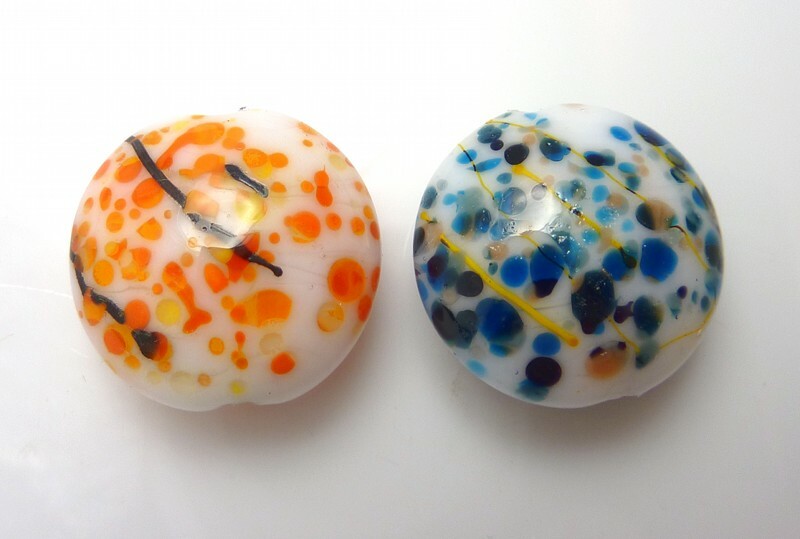 Many thanks to Julie of Lush Lampwork for sending me some diopal white! It arrived last weekend and I’ve been using it. 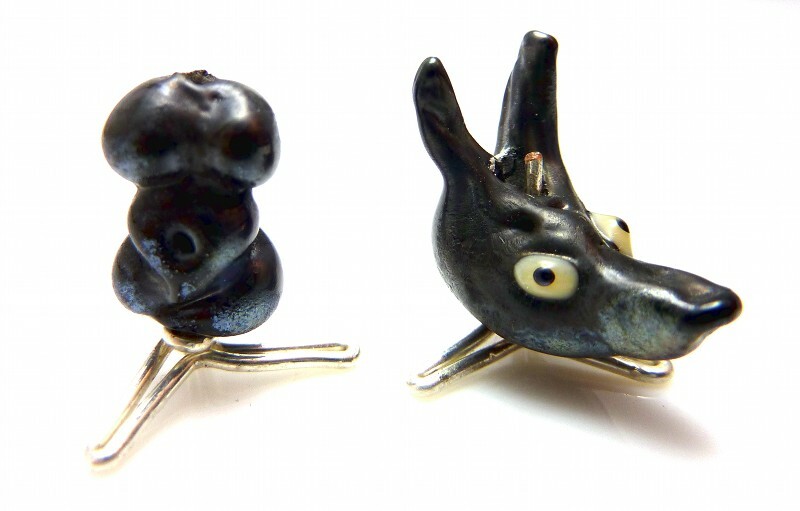 But first: I tried a tiny goddess bead in black (it’s less than 15mm tall) and my boyfriend requested an Anubis head. I like the goddess’ back better than the front – need to get Lavendercreek’s tutorial! The Anubis looks a bit more like a fox… Eyes are vanilla. Then I did a black lentil with vanilla stringer – I didn’t get it all entirely melted in, so there isn’t as much in the way of blue edges where it sinks in as there could be. I saw Lorna Prime’s demo at the Flame Off, and these were my first goes. More practice needed! My black stringer was too thick to begin with for the first one, and I think I’ll have to try more carefully and see if I can melt the black in more gently so it doesn’t go so rough. My line went wiggly at the start on the second one, so I went with it. First one is a cider base, second is clear. At the front is black dots over dark post office red – it spread more than I wanted so most of the surface is metallic rather than red! 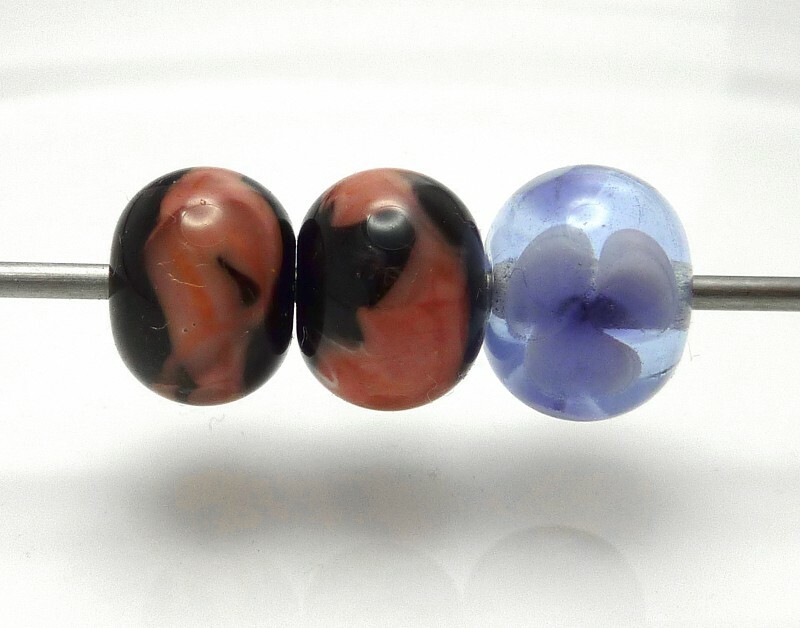 Right bead is vanilla and black trails over a royal blue base. Didn’t quite turn out as expected (I was thinking more smaller lines would be visible), but would make a great cloudy night sky if I could repeat it on a lentil. 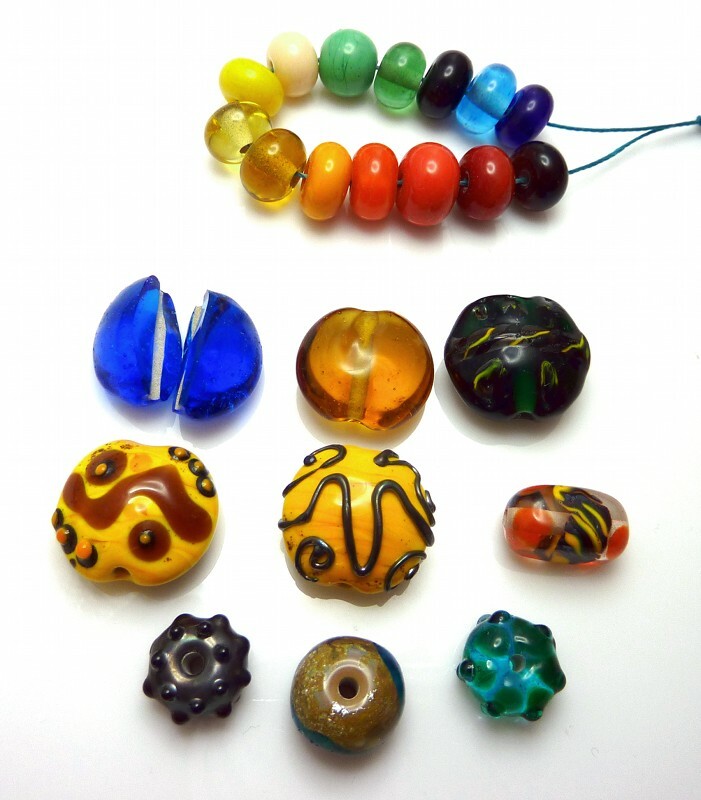 The stripey bead, 2nd row right, is water green with dark post office red on top, stretched into lines by encasing with clear. I found this so much easier than the last time I tried it (with Effetre) because the clear melts quickly compared to the other colours. I’m not sure if it actually melts faster than a not-too-thick rod of Effetre clear, but after using this glass for a while, it sure feels like it! 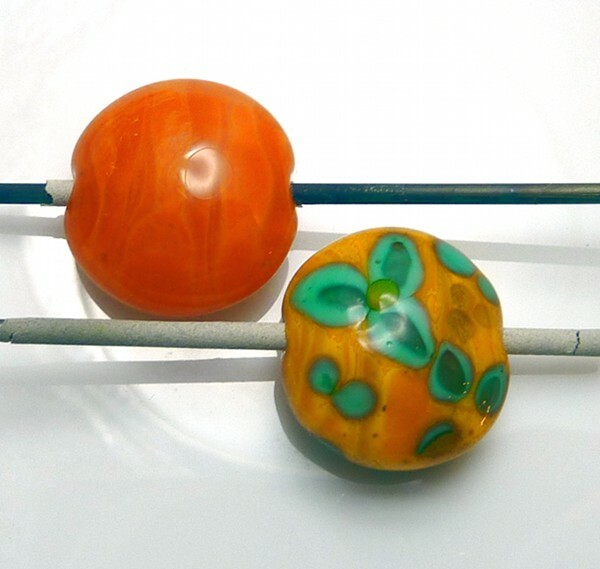 The little black dots on diopal white bead is slightly metallic in the centre of each dot, but it’s hard to see. 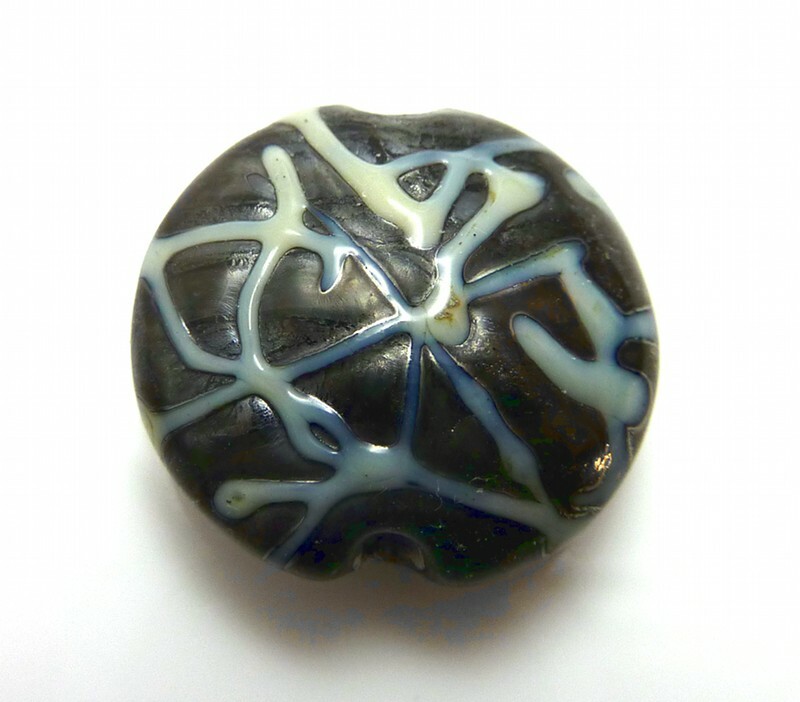 And the big bead is a mostly-collapsed hollow with black and diopal white dots on top. It was a bit challenging to place the dots, because the white goes totally clear when hot, so you need to let it cool quite a bit so you can see what you were doing. The royal blue and burnt orange one at the back was a hurried affair as my bead release broke and I had a freely spinning bead when I was halfway through melting down the original disk. So I added the orange dots round the edge, finished melting it down and put it away fast. Beadysam frit on clear, diopal white and black (apart from the third, which is more MCD). 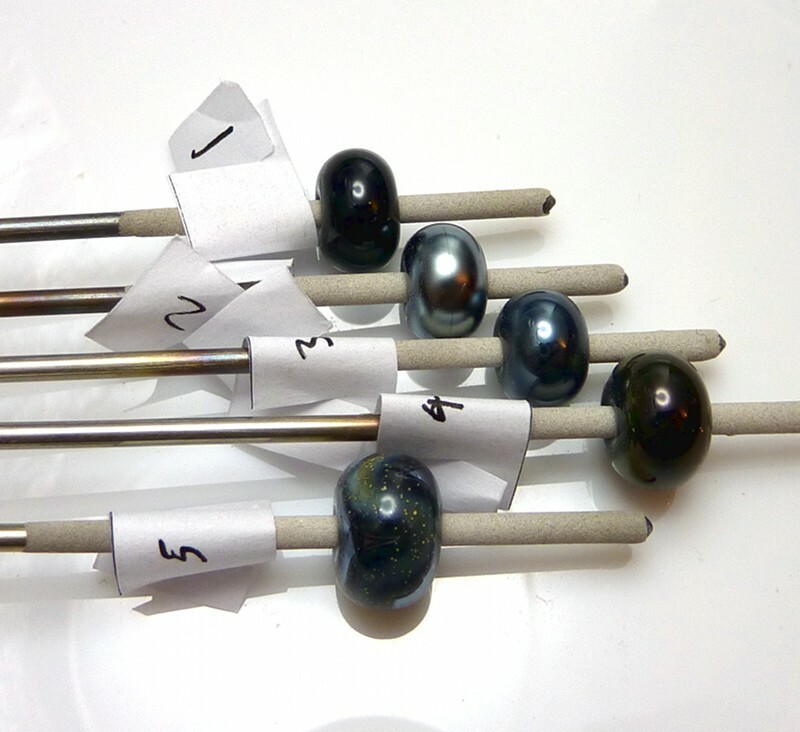 L-R: Gem Surprise, Going Loco, MCD, Jungle Raku x 2, Dragons Candy, Deep Seas. When melting in on the clear, I seem to have bubbled the surface. 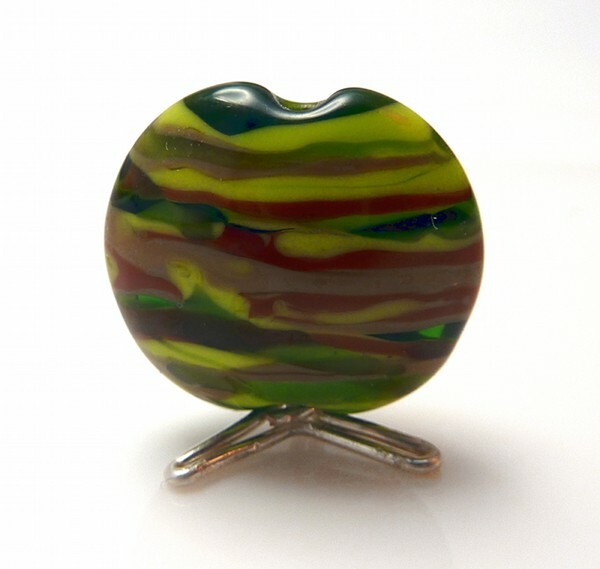 The Jungle Raku on black has thick black lines round the frit – the ends are metallic but the rest mostly isn’t. Orange Grove over some black stringer, and Smokestack over some bright orange stringer. 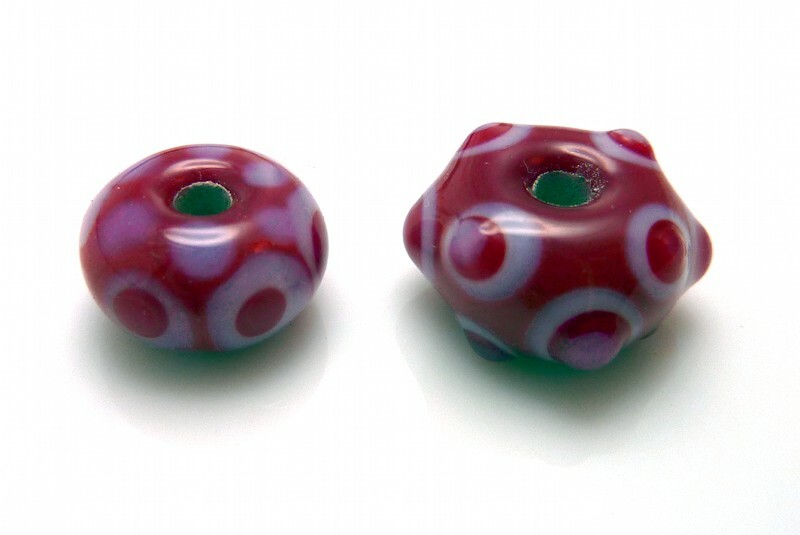 Lastly, dark post office red with diopal white dotties. The white has made the whole bead look slightly fuchsia. Here’s the last of my current lot – I’m going to go back to playing with my 104 for a bit now. Mint green with diopal white. The white sunk in a lot. The mint did its weird cellophane thing on the surface again, which I really don’t like. It’s a nice colour, but I think I’m going to have to keep it under encasement if it keeps doing this. I think I might etch this one and see what it looks like then. This is royal blue, water green and diopal white. The blue and green have a swirl in them too, but obviously you can’t see that at all. 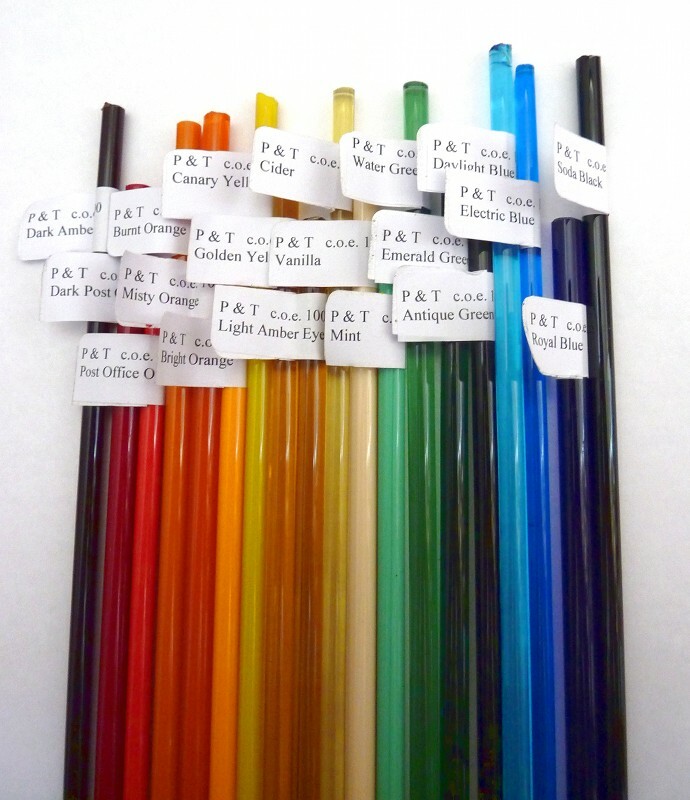 If you want to try any of P&T’s glass, they sell over the phone only, or Sooz at The Bead Shed sells sample packs in both 100 and 93 CoE on eBay. Some faux boro – straw yellow with iris gold frit, pulled into stringer. I was trying some things to see if they cut down on the cola tones. These are over white, then encased. 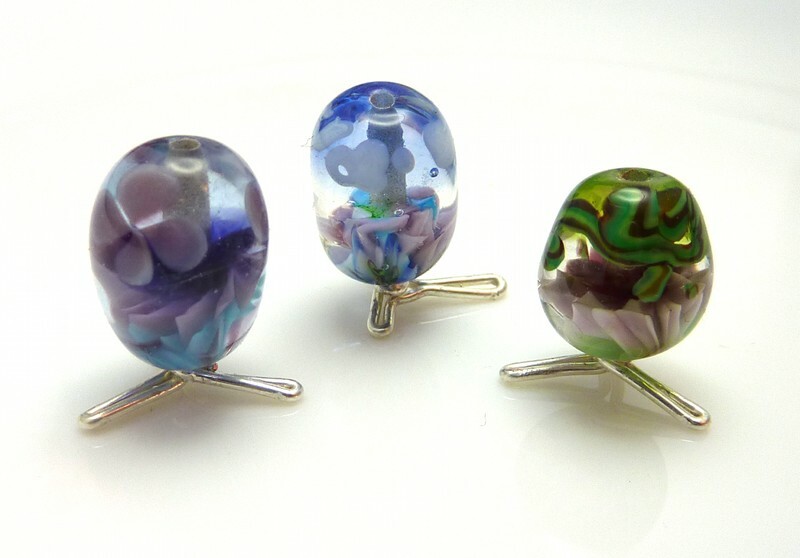 The dark one 2nd from left was encased in teal – not such a good idea! The other two are me trying out blends of the small amount of frit I had, over white. 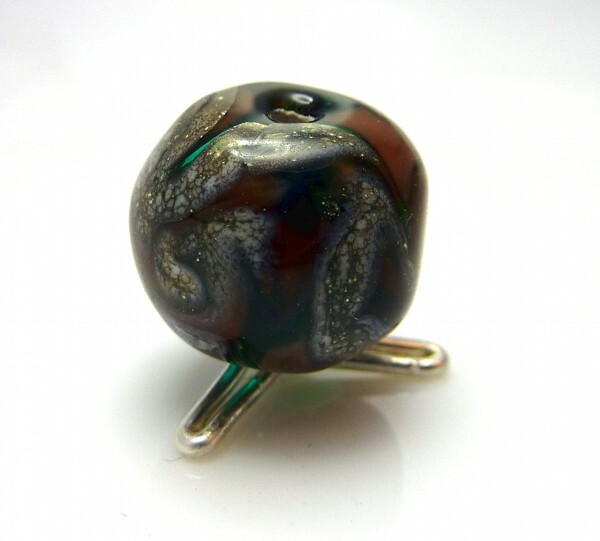 I call this bead “Who do you think you’re calling fugly?” or possibly The Kitchen Sink. 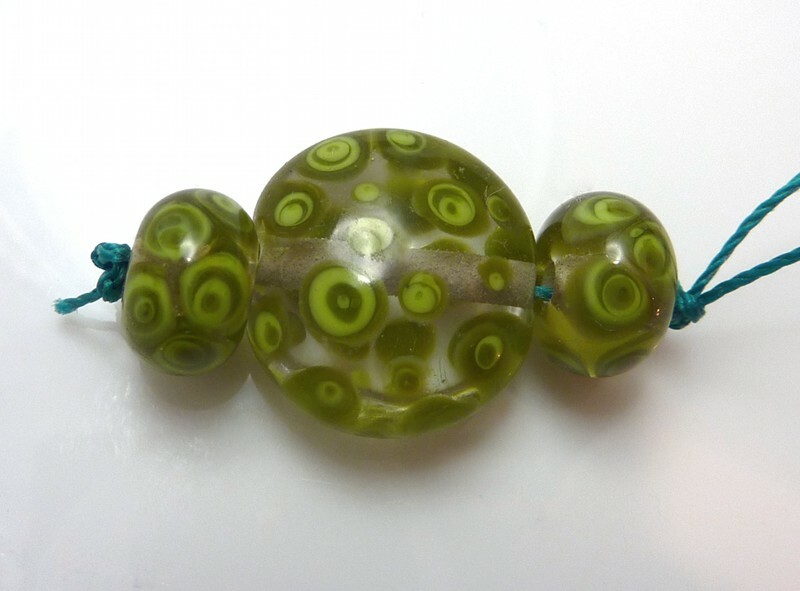 It’s an end of day bead where I started with a teal base and added a bunch of leftover stringer ends and little bits, then put razor creases in it and encased with clear. I capped the ends with CiM Stoneground and some dots of it elsewhere. I then put SIS on top and added some teal raised dots at the very end. 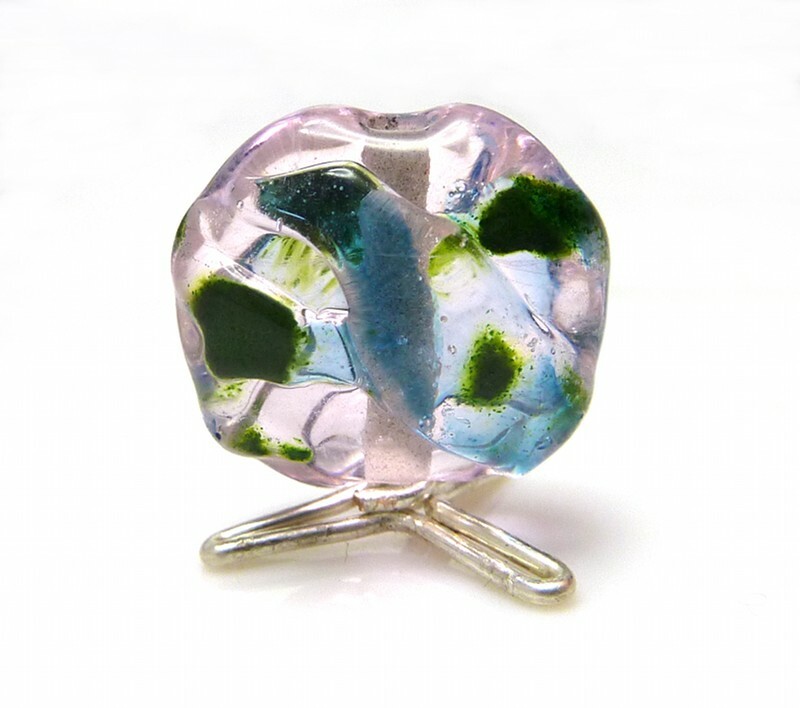 Clear with blue-green frit mix. It probably wasn’t a good idea to start with clear when I haven’t made hollows before, because I think I had a small hole somewhere which eventually got covered up. Then once it was expanding I got a small blowout. The walls are still thick and it is still in one piece – there wasn’t much point smashing it because it’s far too thick to use and it is rather pretty in itself. Then I tried using medium red, so I could see what I was doing as I built it better. 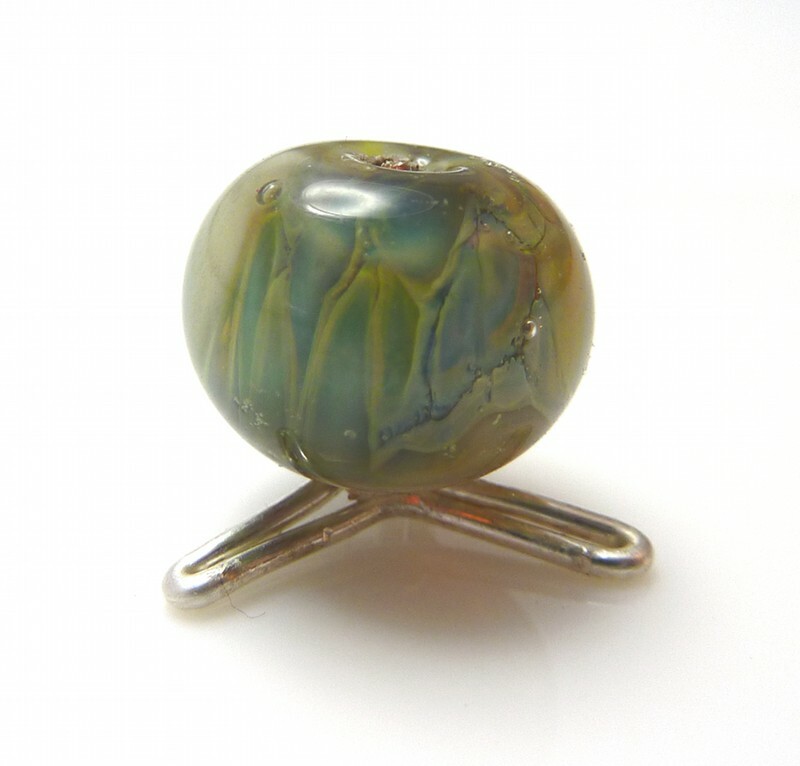 It was rolled in iris opal yellow frit. With this one I got it blown up a bit, put it back in the flame to heat it back up so I could blow more… and melted a hole in one side, assumingly where it was thin. No pics of this one as it’s the same as the next only smaller. Third: same as the above, a bit bigger, and blew out when I was reheating with my finger covering the end of the mandrel. Fourth shard: same again, but in orange. This one worked a bit better in terms of regularity, and it’s a bit bigger. Still not as thin as it should be. I tried some more implosions – it’s still very tricky to work out what I’ll end up with when I’m choosing the starting point. These have surface decoration on the sparser end of the implosion – vine cane, clouds or flowers. 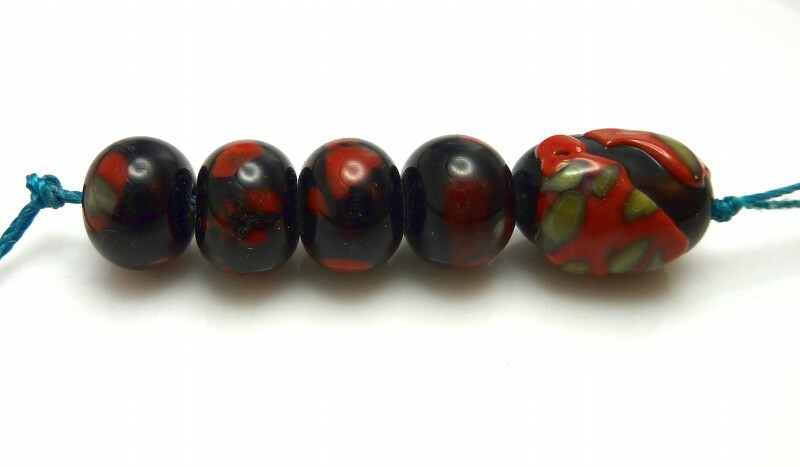 Two end of day beads: black base, coral stringer trails, little bits of clear on top. Also a pale blue round with ink blue on anise white flowers. Sage green with CiM Canyon de Chelly trails and SIS on top. Then the same with CiM Khaki. End of day bicone. 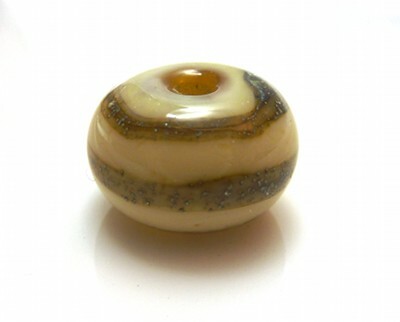 The centre is pastel yellow with black trails and light amber on top. Sage green wraps on each end, and SIS on top. 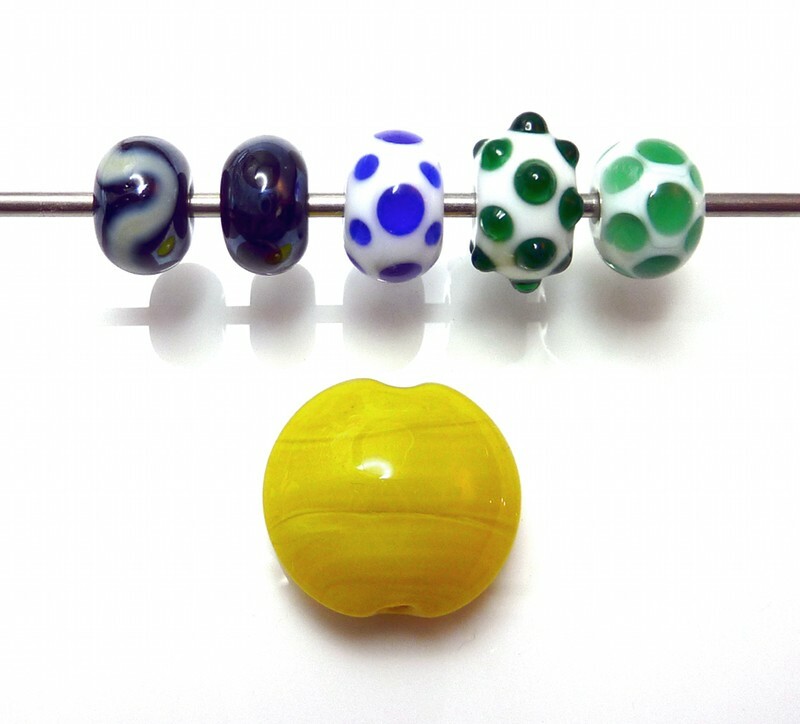 R-L: Pea green, yellow opalino, dark turquoise transparent, light turquoise transparent, teal and sage green transparent. Teal base with Vetrofond odd light red jasper, dark amber and SIS on top. 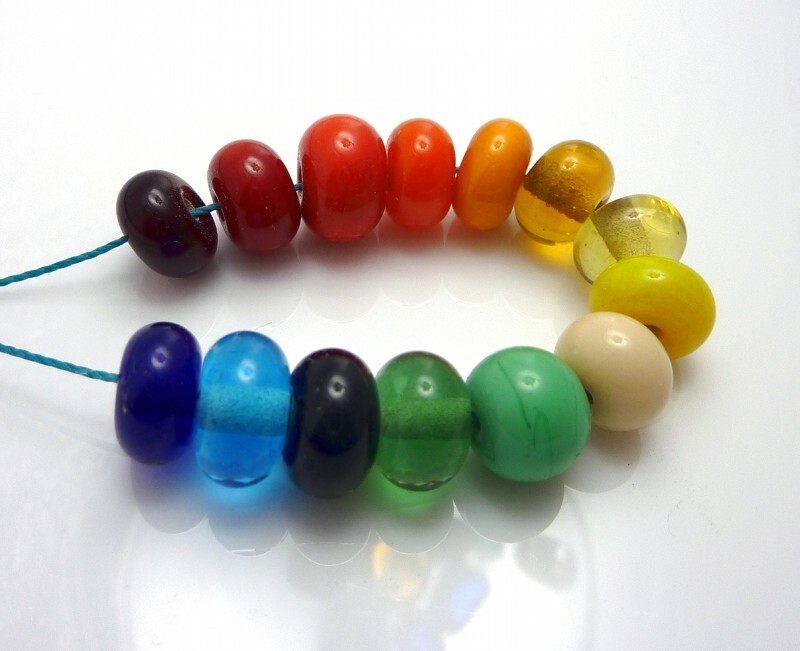 Somewhat inspired by Michael Barley’s baleen beads – I mean to get the tutorial at some point. 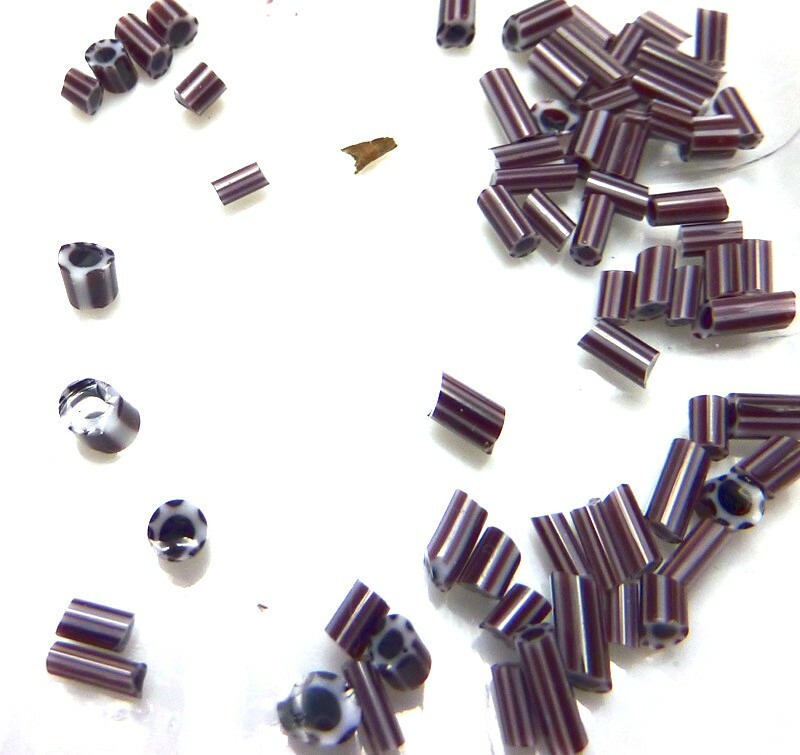 This was a dark purple transparent cylinder, with razor cuts and encased in clear. But you can’t see the cuts because it was a transparent… Oh well, you live and learn. It has CiM Canyon de Chelly ends and dots with SIS added. 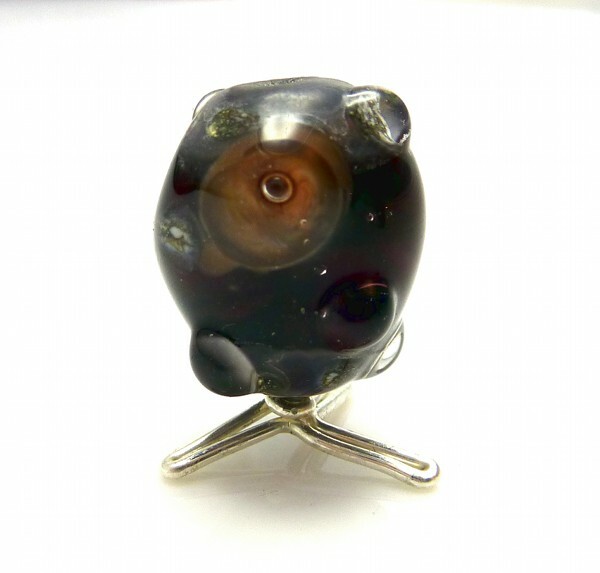 The eye is Vetro odd light red jasper, plunged and covered with clear. There are some other small clear raised dots around to balance it. Eye 2 is similar, but with petrol green inside and in a tab shape. Don’t think it worked particularly well. Here’s them all collected together. 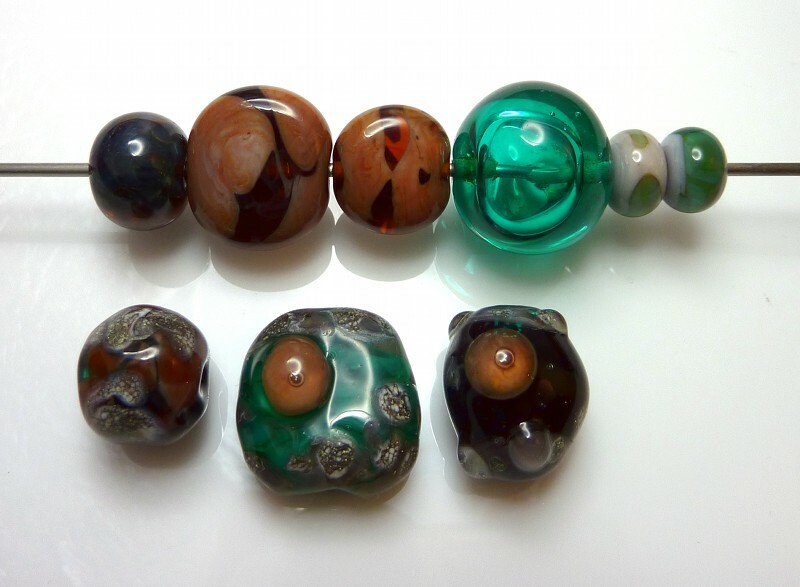 The top row left to right are: another go at faux boro, two tabs of Vetrofond odd light red jasper over dark amber, my first hollow in teal, and the last two were going to be a hollow but the bead release broke in the middle so I just rounded them off – teal over odd light red jasper. 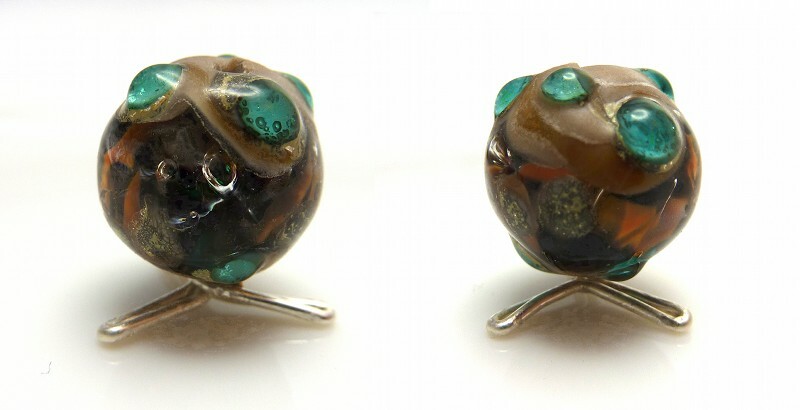 On a Cricket I made two rounds with Reichenbach Ocean (the second also has dark blue transparent frit, which I didn’t know was transparent at the time and so doesn’t show up) and a cylinder made of transparent grey with Reichenbach silver brown on top, reduced. Didn’t get much out of that, only the ends struck and I should have encased it anyway… Not wonderful shapes – a suddenly hotter torch and 2.4mm mandrels when I’m used to 1.6 will do that! Also no marver in my immediate vicinity, so the cylinder was shaped on the bench top. 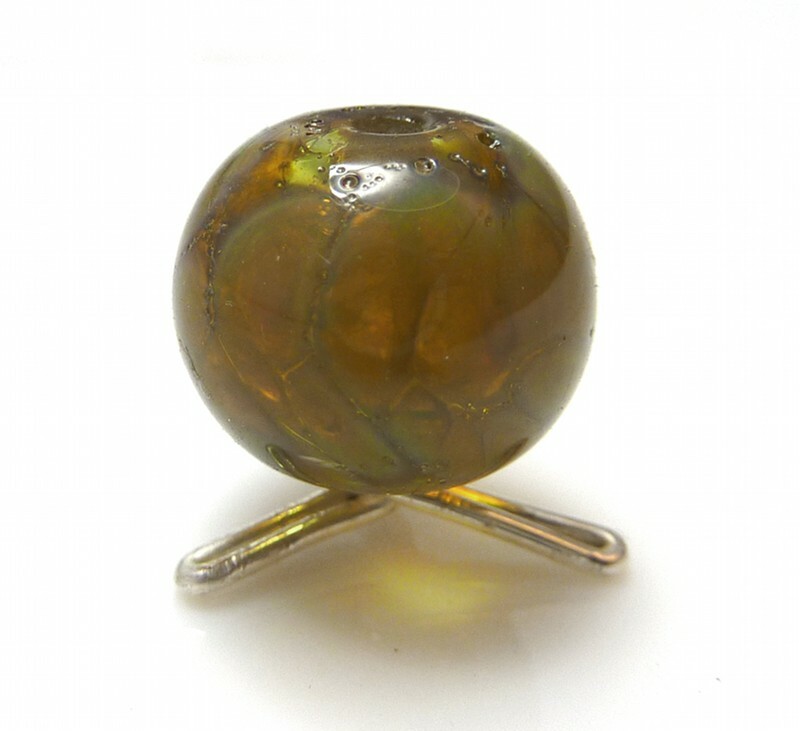 On a Minor I made a clear round, encased in DH Aurae with clear dots on top. Reduced to lovely gold and managed to squish it in the fibre blanket (lots of light = hard to see if it was still glowing). Then I made a mimosa round with some commercial murrini on it. I was planning to do more (there was a rod of Psyche grinning at me) but then it was clear-up time.